Bryn Aven refuses to give up on her dream of serving the kingdom she loves. It's a dream that brings her to a whole new realm… The glittering palace of the Skojare. The Skojare people need protection from the same brutal enemy that's been threatening the Kanin, and Bryn is there to help. Being half Skojare herself, it's also a chance for her to learn more about her lost heritage. Her boss Ridley Dresden is overseeing the mission, but as their undeniable attraction heats up, their relationship is about to reach a whole new level, one neither of them is prepared for. As they delve deeper into the Skojare world, they begin to unravel a long hidden secret. The dark truth about her own beloved Kanin kingdom is about to come to light, and it'll change her place in it forever… And threaten everyone she loves. Bryn and Ridley have returned home with Bryn still nursing her injuries from Konstanin and his new accomplice escaping the Storvatten dungeon. The Skojare Queen is still missing, now presumed dead and her husband putting an end to the search for his wife. But with Bryn's injuries, King Evert has now declared war on Konstanin and is preparing his Kingdom for battle. Bryn refuses to believe the Skojare Queen has met with foul play and enlists the help of Ridley to find her, against the King's wishes. But the Queen's disappearance runs much deeper than the castle and Bryn finds her investigation being stonewalled once again, discovering more than politics at play in the Skojare kingdom. She's never felt a sense of belonging, but none more apparent than now. Even with her feelings for Ridley taking a toll on her emotions, he isn't the only one seemingly interested in the affections of the tracker. As Bryn discovers the truth of the Skojare heir, she's betrayed and framed for a crime she didn't commit. There's only one person that can help Bryn and provide the answers she needs, but with the kingdom on lock down, she has no choice but to escape into the human realm. In Ice Kissed, we see Bryn still troubled by the investigation of the Skojare Queen's disappearance while still punishing herself for allowing Konstanin and his accomplice to escape. With word of her injuries reaching the King, war has been declared on Konstanin with both high society and guards alike being trained for combat. Bryn blames herself but is beginning to realise that Konstanin isn't the enemy, but a scapegoat of the kingdom where tensions have increased tenfold. Her friendship with Ridley is tense at best, scared to take the emotional risk of telling him how she feels, instead she gives into temptation and settles for a night of passion before journeying to find the missing queen once more. Where in Frostfire, Bryn was capable, but in Ice Kissed she's fierce, determined and we see her human emotions being torn apart by her kingdom and the man she's hesitant to admit she's fallen in love with. Bryn reminds me of a mild version of Celaena Sardothien, not afraid to stand up for what she believes in and seemingly sees emotion as a form of weakness she no longer wants or needs. The only aspect that I find disappointing with Bryn is her lack of character development. She seems to have two personas, outspoken and brooding. I loved seeing her relinquish control in her moment of weakness with Ridley, but hopefully she finds a greater balance with her emotions, or lack thereof in the finale. The pacing is more action packed than Frostfire, and I loved being transported to the watery Skojare kingdom, along with the flirtatious, verging on sleazy prince Kennet. But like her own homeland, transparency within the Skojare is non existent. Guards with a hidden agenda and a cold hearted king that is seemingly in the midst of an emotional breakdown. But in a testament to Bryn's character, she refused to give up, possibly due to guilt in blaming herself for Konstanin escaping custody. I needed to know what Konstanin knew, and why he has involved himself with warning others against an unknown enemy. I felt answers weren't provided and the reader is strung along when all will be revealed come the finale. Hopefully the big reveal as the storyline unravels won't disappoint. 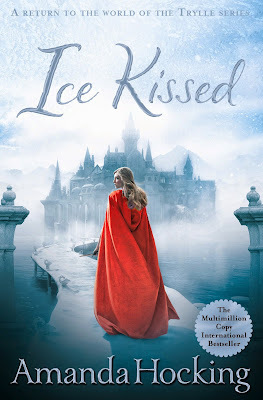 Ice Kissed is another well written and engaging installment in the Kanin Chronicles, but sadly readers are still left with more questions than answers. I loved the defining point of Bryn and Ridley's relationship and exploring the Skojare kingdom, but it felt like a cleverly disguised sequel that doesn't add much to the overall storyline. I enjoyed it nonetheless. Readers will be expecting a well crafted finale that finally gives us the answers we so desperately seek. A big task, but I'm more than confident that Amanda Hocking will deliver with her trademark style and flare. Agreed! I'm expecting an epic finally. I've got my fingers crossed too Sarah. The books have gradually gotten better, so the finale should be incredible! Oooh, I can't wait to finally give this series a shot next week (They're both scheduled for Wednesday and Friday! Bahahaa) Makes me happy that the heroine is someone I could root for. It would be such a bummer if I end up not liking a book because of the main character being a flat individual. Plus, a tamer version of Celaena Sardothien would still be kickass! Much, much tamer though. She has the backbone to be an incredible character, but her indecisiveness really lets her down at times though. In terms of entertainment, I've really enjoyed the series so far, but need those answers which I expect the finale to be able to wrap up. *cautiously skims review to avoid spoilers because hasn't read the first book because is slack* I do so like these covers. Can I be shallow enough to admit I'm interested purely for covers? YUP. I AM. Of course you can. Gosh, I think almost all of the books I read are due to pretty covers. That's what draws you in first though. I preferred this much more than Frostfire actually, the series seems to get better with each installment. I'm so glad Alana made me read it too. I kid Alana. But I enjoyed this much more than Frostfire though, it was more action packed and the romance super intense. But it didn't answer any of the leftover questions from book one, which irked me. I need answers and have my fingers crossed that the finale delivers those much needed answers. You both love me for it :P Crystal Kingdom is better Kelly. I can tell you that! Just skimmed your review Kelly since I'm still not finished with the first book. I'm pumped out though because now I know the sequel won't disappoint me. I think the finale should be even ore epic. Fingers crossed. really looking forward to seeing your thoughts on Firefrost Paula. Hope you're enjoying it so far. Even though those second books do leave a lot to be desired, the series looks promising! I may just have to check with my local library and see if this series is available. Yes, definitely check if they have it. It's fantasy, but without being too overwhelming and really easy to get through. I really enjoyed it and makes me wonder why it's only now I'm starting to enjoy fantasy reads even more. I've been missing out. I haven't heard of this one before but I've heard plenty about her Wake series to know that it's probably not up my alley. So great to see that Bryn turned into an even more badass and amazing in general character for the sequel! I tried to read Wake and that wasn't my thing either, but this series I've really enjoyed so far. I like Bryn, despite the issues I have with her character. But I need answers and looking forward to the finale now. I haven't read any of these, but thanks for sharing. I'm sorry the book left you with more questions than actual answers. That can be frustrating! Good luck to those entering. The series is pretty good Lauren, even if this one felt like a bit of a series filler. Onward and upward to the finale now. really looking forward to it. Ooh, looking forward to seeing what you think of the audiobook edition. I really enjoyed Ice Kissed, even more so than Frostfire. Luckily we don't have much longer to wait!